Adding green tea and lemon juice to your diet can help you create a calorie deficit for weight loss. Typical, fizzy drinks contain sugar or corn syrups that can amount to about 200 calories per serving. Replacing these soft drinks with healthy low-calorie options, such as green tea and lemon juice, can help you kick-start a weight loss regimen. Exercise and a diet of whole foods along with green tea and lemon juice are vital for successful weight loss in a safe and healthy manner. Green tea also contains compounds that can help boost your metabolism and aid in weight loss, according to the University of Maryland Medical Center. Purchase your ingredients from a health food store. Choose natural or organic green tea and lemon juice. You can also buy whole organic lemons from a grocery store to make juice. Drink green tea instead of a morning coffee. Coffee is often accompanied with milk and cream, which increases your calorie intake. Drink plain green tea, which also contains caffeine and provides energy for increased alertness. Add lemon juice to your green tea. Squeeze half a lemon into a cup of green tea. A preliminary study, published in 2007 by Purdue University found that lemon juice helped green tea retain its antioxidants. Some of these antioxidants, such as epigallocatechin, also known as EGCG, may help boost your metabolism and support your weight loss efforts. Replace sugary beverages with lemon-infused green tea. Make iced tea by allowing the lemon-infused green tea to cool and add ice. Leave it unsweetened, as lemon and green tea have naturally pleasant flavors. There is 140 calories in a can of cola, while green tea and lemon juice have virtually no calories. Drink a large glass of unsweetened green tea with lemon juice before a meal. A study published in the “Journal of the Academy of Nutrition and Dietetics” found people ate 75 calories less during lunch or dinner when they drank a glass of water before eating. The same effects could be achieved with green tea. Drinking green tea and lemon juice alone won’t help you lose weight; you have to combine a reduced-calorie diet with regular exercise. The Centers for Disease Control and Prevention recommends you get 150 minutes of moderately intense exercise such as jogging, dancing, cycling or swimming. Eat a diet of whole foods, including plenty of fresh fruits and vegetables, low-fat dairy, lean protein and whole grains. Green tea contains caffeine. 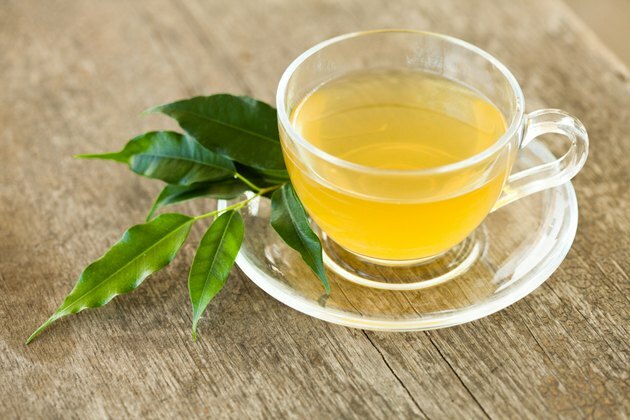 Drinking too much green tea could lead to excess caffeine intake. Discuss with your doctor how much caffeine you can safely drink. Coca-Cola: How Many Calories Are There In A 330ml Can Of Coca‑Cola?